As you can imagine, gas-guzzlin' over-the-road band-van-behemoths have fallen out of favor with traveling musicians, the mini-van and it's ilk becoming evil necessities. Owners balance the soccer-mom-mobile's "lack of cool" against increased MPG figures and their effect upon the bottom line. Probably a good thing. 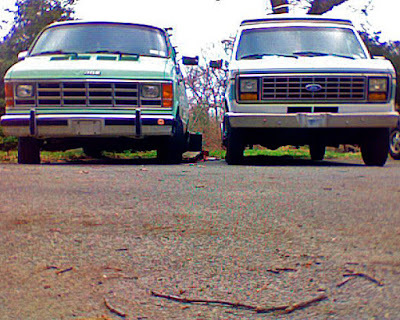 My Ford custom van on the right is ironically known as "the tour van". The van's 8 MPG fuel economy turns anything other than a short trip into an exercise in fiscal/ecological irresponsibility, and it was recently taken off the road to replace the valve cover gaskets. I've used it for gig transport, and with the Lantern Sound Mobile Recording Rig as a isolation room and/or control room. While being repaired, it's parked next to Nancy Atlas' Dodge van, AKA "Large Marge" (left), at an undisclosed location. Anyway, everyone thought the trucks may have been sleeping together, because Marge has had a swollen fuel tank of late. Sure enough, after a recent checkup, mechanics said that in about 9 months, or 900 miles (whichever comes first) she's due to give birth to a litter of mini-vans. Until then, Marge is on a strict diet of hi-test fuel and the most modern of synthetic lubricants, while the Ford "Tour Van" has a fridge stocked full of beer, with a poker game happening in the lounge every night.